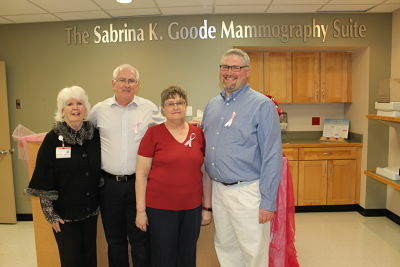 Bradford Regional Medical Center dedicated the Sabrina K. Goode Mammography Suite Tuesday. The suite is named in memory of Goode who worked as a radiologic technologist in the hospital’s imaging services department until her death in September 2015 following a courageous battle with breast cancer. Even when she didn’t feel well, she persevered and showed up for work, never complaining or wanting special treatment, and working up until the week before her passing. She inspired her patients and coworkers with her strength, positive and loving attitude, and love for her work and her family. She was the strongest person we knew, said Tina George, manager, imagining services at BRMC. Funding for the suite is made possible through donations to the Sabrina K. Goode BRMC Imaging Services Fund which was established by her BRMC colleagues. “BRMC is proud to honor and remember Sabrina and thanks the family, colleagues and friends for the establishment of this new fund to make the Sabrina K. Goode Mammography Suite a reality,” said Francie Ambuske, executive director at the BRMC Foundation. A 1999 graduate of Westminster University, she also graduated from the BRMC School of Radiology in 2002 and started her career at BRMC shortly thereafter. She is survived by her husband, Jesse Goode of Killbuck, NY, and children, Ethan, Abigail, and Samantha, and her parents, Carol and Robert “Bucky” Thompson of Kane. “No parents could have asked for a better daughter than Sabrina. She was a terrific daughter, wife and mother. You could see her strength when she was battling cancer. We sure are proud of her but wish she didn’t have to go so early in life,” the Thompsons said. For more information, to donate to the Sabrina K. Goode BRMC Imagine Services Fund, or how to establish a named fund, call the BRMC Foundation, call 814/362-3200. Photo caption: Francie Ambuske, executive director at BRMC Foundation, left, stands with Sabrina Goode’s family during a dedication ceremony Tuesday of the mammography suite named in her memory. From left, are Ambuske, Goode’s parents, Robert “Bucky” and Carol Thompson, and her husband, Jesse. Posted by BradfordToday on Feb 23 2016. Filed under Local News. You can follow any responses to this entry through the RSS 2.0. You can skip to the end and leave a response. Pinging is currently not allowed.